Bodywork & Yoga have taught me to Understand Messages the body is communicating through feeling. They have taught me how to see and listen to my own body and others what is being expressed by the tissues, organs, bones, nervous system, blood, and emotions. Bodywork is a means of communicating with another being through the medium of Touch. The communication is happening within the neuro-muscular-fascial-fatty-lymphatic-vascularized sleeve of tissue that surrounds everything in the body down to bone, organs, & brain. The method of communication is through engaging this sleeve of tissue in an infinite number of ways. The conversation happening in bodywork can go in many directions depending upon how we use touch. The dialogue I seek is to meet someone at the level where they can receive me. To be in a breath by breath interplay of feeling and releasing tension at the organic rate that is unique to each person. This gives someone control so they learn how to let go of control and feel what is beneath that, safely, without being overstimulated or put into defense mode. It is at the “neural edge” that communication becomes fascinating. Every tissue has a neural edge to it, whether it is locked short or long or interwoven deeply between layers or especially if there is emotional reactivity laden in the tissues. If you press in too hard too fast, this communicates a threat even if your intentions to release the tissues are good. The response to a threat is to contract against it. This is a very confusing form of communication because it is nearly impossible to be in a state of release and defense simultaneously. When the entire neuro-muscular-fascial-fatty-lymphatic-vascularized sleeve is engaged in a way that its entirety feels good, than the deeper layers of adhesions, scars, and compensatory patterns show and release themselves with more ease. The most profound approach to communicating with the body is through the Caress. The Caress is the backbone of all touch techniques. It is best displayed in how Mom or Dad soothes with touch their young child, or how a dog and dog-lover communicate through play and petting. The medicine of the Caress comes through in how it communicates to the receiver that they are perfect as they are, they are worthy of being touched in a way that makes them feel good, and that they are safe, loved, and cared for. Yoga becomes a tool for internal listening and checking in with our body. An opportunity to feel our tight spots, our injuries, our organs, our emotions. Feeling the needs of these areas of ourselves is both overwhelming and powerful. When we begin to feel into our body, we start to feel many of its unanswered needs. This can be overwhelming. Each time we recognize a single need, acknowledge it, and give attention and action to it’s fulfillment we are empowered. Yoga teaches us discernment of what is life-enhancing or energy depleting, physically, emotionally, & mentally. A key in developing this relationship and skillfulness in enhancing our wellness is to learn how to make every Yoga asana, or posture, work for you. Every asana has an adaptation ready for you. A good strategy is to create an internal environment inside of each pose where you can still access and maintain deep breathing. Each time you practice your enhanced body’s intelligence will guide you towards new adaptations and ways of feeling and breathing in each pose. So will a good Yoga teacher. I came to Forrest Yoga in 2002, as a Bodyworker on a referral from my mentor Dr. Vincent Medici. He told me Ana Forrest had honed a form of Yoga that was healing on Physical, Emotional, & Spiritual levels simultaneously. I took one class at her studio in Santa Monica, felt something resonate inside, and enrolled in her 8-week Foundational Teacher Training that was starting the next week! 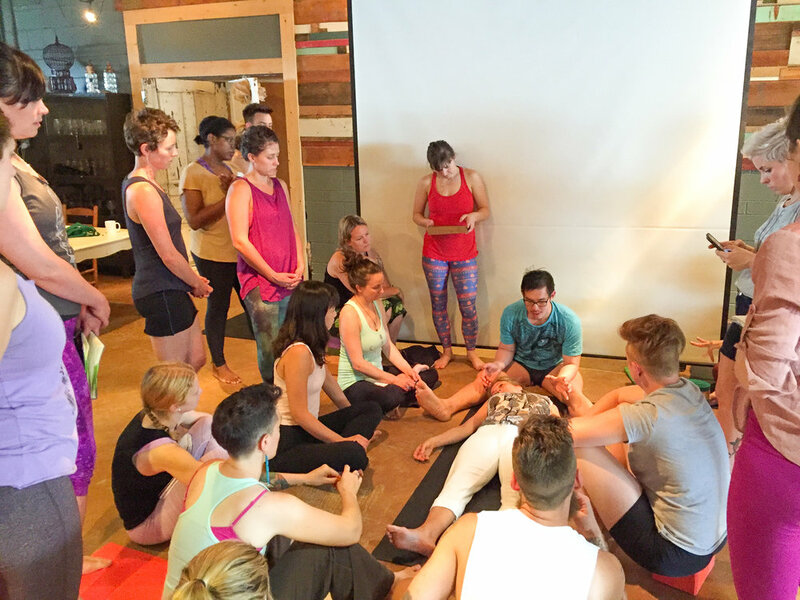 This experience shook my core and changed my life, empowered my Bodywork and everything I believed possible about hands-on work, and gave me super strong tools to hone my own skill as an Structural Healer. Starting one month after I finished that training I began teaching Forrest Yoga. I have continued to teach Forrest Yoga classes every week since that day over 16 years ago.